This spacious villa is situated in one of the desirable communities, Hampton Lakes with tennis & basket ball court, a play area and a community pool. The villa has 2 master bedrooms with en-suites downstairs and 3 more bedrooms upstairs. Perfect for parents get-away! One of the master bedrooms and one twin bedroom have amazing lake views. It now boasts a flat screen TV and brand new sofa sleeper set in the lounge. Fully air-conditioned and now has key-less entry front door. It has cable TV, Internet with WiFi and free phone calls within USA & Canada. Non smoking and pets are not allowed though we love animals. We're medical doctors from Mancheseter, renting our own home to the guests. We bought this villa as our home away from home as we love everything about Florida! We hope you'll enjoy staying there as much as we do. We're flexible with the departure time. Just contact us for more details. 2 En-suites downstairs and one family bathroom upstairs, all with new shower heads. Spacious living room with sliding doors going out onto the pool area overlooking the lake. Perfect way to sit in the lounge to enjoy the amazing views. New sofa sleeper set and flat screen HD cable TV have added more comfort to the living area. Highlands Reserve Golf (5 mins, 1.3 mile from villa). Championsgate Golf (less than 10 mins from villa). Ridgewood Lakes Golf (10 mins South of villa). Southern Dunes. Orlando Golf & Resort. Notes on accommodation: The villa is fully air-conditioned/heating. Also included are TV, CD player, phone, internet, books, board games and baby facilities. Outside: BBQ can be requested to management team for approx $50 per week including a propane tank (arranged separately by the management). There are patio furniture for relaxing by the pool overlooking the lake. Pool heat charges are additional to the quoted price. We charge £100 or $135 per week for the pool heat ( or £15 /$20 per day ) Utility Room: Also has a washing machine and a dryer. High chair, stroller, crib also provided. Cleaning / Towels / Linen / Maid service: Towels and linens provided. Cleaning service can be requested during stay for small extra charge. Other: A garage has been converted into another sitting area and a newly installed pool table for games room. Great location, good leisure activities pool , games room, tennis and basketball courts. Plenty of crockery , cutlery, cooking utensils and linen. New outside seating cushions delivered first day of our stay. However there were a few small issues but overall we enjoyed our holiday. Clean and comfortable -small problems solved very quickly - plenty of bed linen, towels and kitchen equipment. Stunning view over lake - only small problem swimming pool did not appear to be cleaned during our stay. Although switches missing on washer this was not a problem. Thank you Hazel for your wonderful review. You're definitely welcome back any time to stay there again. I will look into your pool comment and make sure that they do a better job ( Please can you call our management about this and they will take care of ii if it ever happens again in the future ). We had a problem with the refigerator (freezer didn’t freeze), and after a couple of unsuccessful service calls, they brought out a new refigerator. Manager was very responsive. The property was clean, and the view was very nice. Would have given it five stars if the freezer had been working from day one. Thank you for your wonderful review. We apologise for the inconvenience caused during the days when the freezer was not working. We hope you had a wonderful time in spite of that. So very sad to write this buts it's our experience and we paid a lot of money to stay for 3 weeks so expected so much more . Location is great in a nice complex with great lake views. Owners and management quick to respond to issues raised. Several mesh panels broken so pool area full of bugs. Pool guy arrived said he couldn't do it but then did after I complained. Patio furniture is very old looking dirty and torn in places. I don't mean sun damaged I mean very dirty this was then power washed but made no difference. I have visited Florida 20 times and this is the worse villa I have ever had . Thank you for your review but obviously, it's very sad to read it and to know what you thought of our villa. I feel the need to clarify a few things you pointed out. As you may be aware, we have excellent reviews from our past guests and in fact, even from the guests who were staying just before yourselves. As owners who live far away, we always try to improve our villa from the guests's recommendations and from our management team's advice. I will try to go through your concerns in order. 1. Once we knew about the sliding door not as smoothly operating, we have contacted the sliding door company who are fixing this. 2. Patio door blinds are actually new but due to being where it is and people using this door most often, we need to replace the slats quite regularly. We're planning of using different kind of blinds instead now for that door. 3. Pool cleaners have assured us that they only use safe cleaning products. 4. During your stay, there was a storm and a few mesh panels got torn. When the person came to replace them, he couldn't get hold of the right size of one mesh panel on that day and needed to come back again. But this was all fixed. 5. Pool furniture is of natural straw colour and 3 of them are only 1 year old. We are planning to replace the rest with more new furniture. The natural faded colour can unfortunately give the impression of being old. We have power washed them and they were at least not dirty. 6. Washing machine and tumble dryers are only 2 years old. Unfortunately, one of the past guests broke one of the setting knob for the load size and we are waiting for the parts to be replaced. It still is functioning as normal. 7. Light bulbs are normally replaced by our management team and all you had to do was let them know. 8. We just bought brand new comforters for the 2 queen rooms and it is not true that they are all old. 9. Master bedroom has a big walk-in closet with plenty of storage. It also has the dresser. 10. We just replaced all the bedrooms with flat screen TVs before your stay and our management team have not had a chance to throw away the old TVs from the garage yet. They will take care of them. I understand there were 10 of you, 8 are children, one with special needs. We always respect guests opinions and suggestions. But please be aware that our villa is in one of the older communities and the villas are not brand new. There are a few wear and tear issues that are commonly seen in rental homes of this age. Very beautiful, clean and spacious home. My family and I had a great time there! We highly recommend it and we would definitely stay again next time we visit Orlando. Many thanks for your great review and for being great guests too. We're so glad that you've enjoyed your stay at the villa. You're welcome back anytime! This was our third stay at Hampton Lakes and this villa was perfect. Really good sized rooms, bathrooms and a good supply of towels and linen. The games room was great for our teenagers, however the long cold winter meant the pool needed heating, and we weren’t home long enough to justify the cost of heating it. It was clean and tidy and had the basics like cleaning products, salt pepper, sugar, tea and coffee! We too felt happy to leave our surplus supplies behind for the next guests to use. I can’t rate this villa high enough - it was everything we wanted in a perfect location. Thank you! Thanks Clare for your wonderful review and for being such lovely guests. 20 minutes From Orlando International Airport. 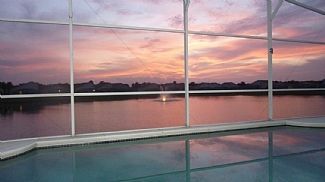 The prestigious Hampton Lakes community is just 15 minutes from Disney World. Publix supermarket, SunTrust Bank, gas station, Berry Town centre & CVS Pharmacy is just 3 mins drive from the villa. Booking Notes: If you want to book our villa, you must complete a booking form.The completed booking form must be signed with either a deposit of 20% or the full rental amount. The mailing address is available upon request. Payments can be made by directly booking via website ( please be aware of website service charges plus 3% credit card fees added ) or payment direct cheque or bank transfer to us with 3% discount. We can provide our payment details at request. Payment method PayPal transactions can be accepted but all fees will be met by the guests.The balance will be due around 10 weeks before holiday. Changeover Day: Flexible. Notes on prices:Daily rate from £100/$130 depending on Season Minimum stay 7 nights. If you want to stay less than 7 nights please contact us, additional cleaning charge will be £90 or $120 per stay. Optional pool heating £100/$135 per week (recommended for October to April). Security deposit £200/$350 will be required with the balance 10 weeks before holiday. This will not be cashed and returned to the guests after your departure inspection report. Pets are not allowed though we love animals. **Premium weeks ( Christmas/New Year/Easter) ** Cancellation policy: - Once confirmed, you may cancel the booking at any time subject to the clauses detailed below. We reserve the right to cancel the booking if payment has not been received in full in accordance with the conditions set out in the booking procedure and payment terms stated above. Cancellation must be in writing. The following cancellation charges apply to all rentals: More than ten weeks before arrival date – £50/$80 administration charge. Less than ten weeks before arrival date – loss of deposit or 20% of rental amount, whichever is the greater. Less than eight weeks before arrival date – 50% total rental amount Less than four weeks before arrival date - 100% rental amount. The security deposit is not subject to cancellation charges and would be refunded in full.